In this day and age of high energy prices and environmentally conscious remodeling, any change that we can make to our home or business that reduces the amount of energy that we use can reap substantial benefits. 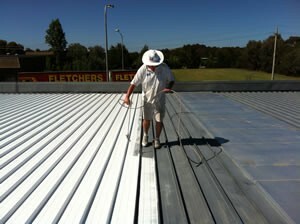 One amazing service that is available to Canberra property owners is cool roof coatings applications. At Fusion Painting Services, our Canberra cool roof painting contractors are here to help you get all of the benefits of this highly rewarding project. Whenever a Canberra resident or business owner hires our professional painters, our team is honored by the trust shown in our skills. In each and every project, we strive to honor that trust by putting our best effort forward to provide the highest quality services possible. In this way, we can guarantee that you will be completely satisfied with the results of our efforts. Call Fusion Painting Services today if you are interested in applying cool roof coatings to the surface of your Canberra roof. Our courteous and polite staff would be happy to answer any questions that you may have about these wonderful services and their fantastic benefits. We can schedule your appointment today. In its most basic form, a cool roof is a roofing system that is designed to reflect more sunlight while absorbing less heat than a standard roof. This is accomplished by applying a specialty paint that is highly reflective. Essentially, your cool roof will function in the same fashion as a light colored shirt in the summer time. Standard dark roofs can reach temperatures of 66 degrees whereas a properly installed cool roof will remain 20 degrees cooler. The benefits of a cool roof are obvious. First and foremost, your cool roof will prevent a great deal of heat from entering the interior of your Canberra property. This results in the immediate benefit that you and your family will remain more comfortable in your home. At the same time, you will not need to rely on your air conditioner as much as you do now with a standard roof. In turn, your air conditioner will last longer and will be less susceptible to wear and tear. Best of all, you will realize immediate savings on your energy bills. At Fusion Painting Services, our Canberra cool roof coating contractors can help you achieve all of you aesthetic goals while acquiring all of these amazing benefits. You are guaranteed to be completely satisfied with the results.